And 1 in 9 are married before the age of 15. In the next decade, more than 14 million girls aged under 18 will be married every year, roughly 39,000 each day. Girls my age should be wearing school uniforms, not wedding dresses. Access to education for girls can help prevent child marriage. Girls with higher levels of schooling are less likely to marry as children. In Mozambique, 60% of girls with no education are married by 18, compared to 10% of girls with secondary schooling and less than 1% of girls with higher education. Complications in pregnancy and childbirth are the leading cause of death among adolescent girls in developing countries. Child brides are more likely to experience violence in their marriages, less likely to be able to negotiate for their own rights, more isolated, and more likely to get HIV. The children of a child bride are more likely to die in infancy, more likely to be malnourished, and less likely to get an education. Child marriage perpetuates family and community cycles of poverty, poor health, and limited participation in decision-making. Taken together, the costs of this practice are too high to be ignored. At its heart, child marriage happens because communities do not value girls as much as boys. So there’s a simple solution to this complicated problem: work with communities to change attitudes towards girls and increase opportunities for girls. We focus on finding community-driven solutions that work in local contexts – such as our TESFA project in Ethiopia, which ran village-based support groups for adolescent girls, and our Tipping Point project in Nepal and Bangladesh, which works with adolescent girls and boys, parents, and community and religious leaders in over 100 communities to come up with strategies that work at a local level to tackle child marriage. 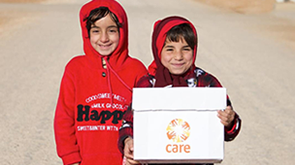 CARE also advocates at the local, national, and global levels to increase the commitment to ending child marriage, through passing laws to protect girls and prevent child marriage, and implementing laws that already exist. Our advocacy extends beyond a focus on formal policy change, towards the larger goal of influencing social and structural change to address early marriage. Four Syrian girls share their hopes and dreams to mark International Day of the Girl.